This model is known to run in both OpenCell and COR, although there are no figures in the paper with which to compare the CellML model simulation output. The units have been checked and they are consistent. Blood testosterone levels in human males are known to oscillate periodically with a period of a few hours. Testosterone secretion from the testes is stimulated by luteinizing hormone (LH) and the production of LH is, in turn, stimulated by the hypothalamic hormone luteinizing hormone releasing hormone (LHRH) (as summarised in the figure below). Interestingly, the observed fluctuations in the blood levels of testosterone can be traced back to the pulsatile release of LHRH. Several mathematical models have been proposed to describe the pulsatile release of these three hormones. Some of these models depend on an introduced delay in one of the variables in order to create oscillations in an otherwise stable model. Examples of such delayed mathematical models include those published by Cartwright and Husain (1980) which describes the control of testosterone secretion, and also the model published by Lenbury and Pornsawad (2005) to characterise feedback control in the hypothalamus-pituitary-adrenal axis in humans. Both of these models have been translated into CellML and can be found in the model repository. However, while delayed models can be biologically realistic (for example there is often a delay between the secretion of a hormone and the binding of that hormone to its receptor and the subsequent response), introducing a delay to a mathematical model often comes at the expense of increased model complexity. (In particular, it should be noted that in its current form, CellML is unable to express time delays). In the paper described here, Enciso and Sontag critique published mathematical models which describe testosterone dynamics. In particular they highlight how models which use time delays to create hormone oscillations can exhibit stability. 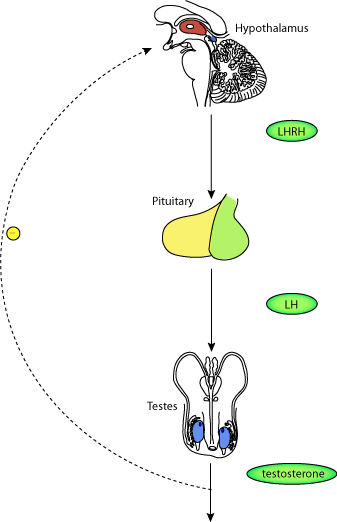 Schematic diagram of the mathematical model representing the luteinizing hormone releasing hormone (LHRH), luteinizing hormone (LH), and testosterone system. The model has three main components: the hypothalamus which secretes LHRH, the pituitary which responds to LHRH by secreting LH, and the testes which, in responds to LH, secrete testosterone. Finally, LH and testosterone feedback on the hypothalamus to regulate LHRH secretion. Derived from workspace Enciso, Sontag, 2004 at changeset 44e8069be14f.